PeerIndex, a service which measures influence and authority on the social web, has just announced a brand new service, PeerPerks, which aims to reward you for your social media influence on sites like Facebook, Twitter and LinkedIn. Much like Klout’s own rewards service, Klout Perks, PeerPerks wants to reward you for being social. The influence marketing platform will allow brands to reward social media users who are in the know about topics that are relevant to their brand. 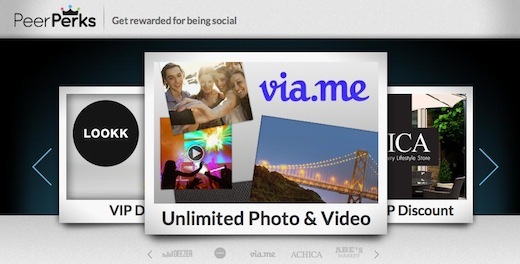 Social media users and brands will be paired up, and the free rewards should flow. PeerPerks has launched with a few brand clients including Deezer, the yet-to-launch photo sharing site Via.me and fashion site, Lookk. Influential users will have the chance to earn themselves free subscriptions on Deezer, and unlimited storage on Via.me. Other brands that have already signed on with PeerPerks include Atlantic Records and Penguin Books. Despite the similar name, the difference between Klout’s offerings and PeerPerks is the sheer scale of it. PeerPerks likens the service to group buying giant Groupon. PeerPerks is positioning itself as Groupon for influence. Rather than offer reduced rates to a huge group of people, PeerPerks gives brands the chance to reward a few influential users, who, in turn, can get them great word of mouth via social media. By rewarding influential users, PeerPerks becomes a far more useful marketing tool for brands, while rewarding a loyal customer base. We’ve already seen just how far a bit of good customer service can go when influential social media users are involved. Peter Shankman earned himself a free steak from Morton’s: The Steakhouse, thanks to one tweet. PeerPerks gives social media aware brands like Morton’s the chance to formalize these little perks that are offered to their best customers. While in Shankman’s case, it isn’t clear whether or not his 100,000+ following on Twitter motivated the great customer service, the fact remains that with PeerPerks brands can generate exactly that kind of buzz for themselves using a platform that makes it easier to find those influential customers. Even with its rewards system, Klout has caught a lot of flak. The ranking site has earned itself criticism on how scores are calculated, as well as being accused of being exploitive. Since PeerPerks has chosen to focus on a niche aspect of Klout’s many features, it has yet to be seen how the service will be received by the public. What do you think of PeerPerks? Let us know in the comments.